I know this photo is horrible, but was a must post. 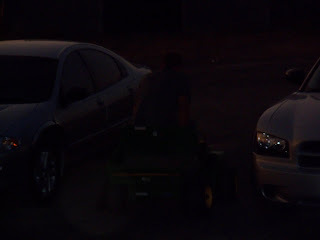 If you look carefully you'll see Brandon, riding Conner's john deer gator, yes people....that is a motorized four wheeler....FOR KIDS.... Brandon definately exceeds both the height and weight requierments, but those weren't stopping him tonight! I caught this photo from inside, undercover. He probably thought no one would see him cause it was dark, but secrets out...some kids just never grow up. They just wait till their kids go to bed and their wives are occupied.... then they re-live all their childhood dreams. Oh, man, just wait till I can harass Brandon tomorrow! Too funny! HE always wanted a four wheeler. Guess he still does.